When Mazo de la Roche was seven, her parents adopted her orphaned eight-year-old cousin Caroline Clement (April 4, 1878 – 1972), who joined in Mazo's fantasy world game and would become her lifelong companion. De la Roche wrote her first (unpublished) short story at age 9. She attended high school at Jameson Collegiate (now Parkdale Collegiate Institute) in west end Toronto, and later studied at the Metropolitan School of Music, the University of Toronto, and the Ontario School of Art, all in Toronto. In 1905, Mazo and Caroline moved with Mazo's parents to Acton, Ontario to operate the Acton House hotel. She was known locally as "Maisie Roach", and lived there until 1908, selling one of her stories while she was there. Her novel Delight was based on her time there, and Acton's geography figures notably in Possession. A few years later in 1911, by now in her early thirties, Mazo moved with Caroline and the Roches to Sovereign House in Bronte, Ontario, to try life as farm owners. By now, de la Roche had resumed writing and was placing stories in American magazines on an occasional basis. William Roche, Mazo's father, died in 1915 of cirrhosis of the liver brought on by alcoholism. Mazo, Caroline, and Mazo's sickly mother Alberta moved back to Toronto. De la Roche continued to write, but at this juncture Caroline Clement was the main breadwinner of the household, working as a civil service clerk. (She would eventually rise to become the province of Ontario's chief statistician.) During the summers, Clement lived in a Toronto boarding house while de la Roche and her mother would stay in a cottage near Lake Simcoe, several hours north of the city. Alberta Roche died in 1920. After this, de la Roche's writing career began in earnest, and Clement and de la Roche were never again separated for any significant length of time. During most of the 1920s, they split their time between Toronto and a cottage they had built in Clarkson, Ontario. The income from Jalna and its sequels allowed de la Roche to become the main breadwinner of the household, after years of having been supported by Clement. The two would make an extended trip to Europe beginning in 1929, living first in Italy, then in the United Kingdom. In 1931 they adopted the two orphaned children of friends of theirs. This was extremely unusual for the time, as adoptions by single women were technically not allowed in the UK during this era; the machinations by which de la Roche and Clement were able to do this are unknown. de la Roche's productivity slowed somewhat once she was in her sixties and seventies. Partly due to arthritis in her hands, much of her later work was dictated to Clement. She still published regularly right up to her death, with her final novel Morning at Jalna appearing in 1960 when she was 81. 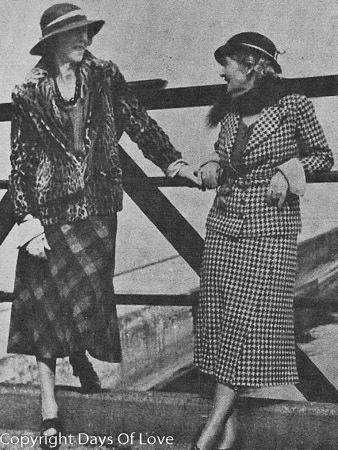 Overall, Mazo de la Roche and Caroline Clement lived a fairly reclusive life, and their relationship was not discussed widely in the press. In her infrequent interviews, de la Roche often expressed a need for privacy. Though there has been much speculation in recent years as to the exact nature of the relationship between de la Roche and Clement, de la Roche's autobiography makes no mention of them being anything other than close companions. Not long after de la Roche’s death in 1961, in accordance with her wishes Clement burned almost all of the author’s personal diaries. Clement died in 1972. Most recently, de la Roche was the subject of a Red Queen Productions and National Film Board of Canada co-production, The Mystery of Mazo de la Roche, which premiered on March 17, 2012 at the Festival international du film sur l'art in Montreal, then had its Toronto Premiere at Hot Docs April 29/12. The film is directed by Maya Gallus, produced by Justine Pimlott & Anita Lee, and combines archival material with dramatic reenactments featuring Severn Thompson as Mazo de la Roche. The film "lend(s) credence to the theory that its subject was a closeted lesbian", although several people in the film who knew de la Roche and Clement, including their adopted daughter Esmée, state on-camera that they believe the relationship between the two was close but ultimately platonic. Mazo de la Roche is buried near the grave of Stephen Leacock at St. George's Anglican Church, at Sibbald Point, near Sutton, Ontario. Later, Caroline Clement was buried alongside her.